Drinks International has teamed up with show organiser Messe Düsseldorf to publish an extensive preview magazine of ProWein 2014, the German wine and spirits show that is now in its 20th year. The March 23-25 Düsseldorf-held event will house 4,800 exhibitors from 50 countries and is expected to attract more than 40,000 wine and spirits trade visitors. Drinks Interntaional's preview of the event inlcudes an overview of the reasons to go, detailed explanations of how to get there and a rundown of the 2014 show's highlights. It inlcudes market insight features, information about ProWein China and an interview with ProWein show director Michael Degen. 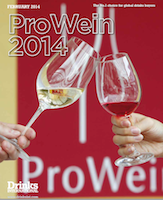 To download Drinks International's preview magazine of ProWein 2014 click here.